Played in a private tournament on Titan today with folks from Cardschat.com. 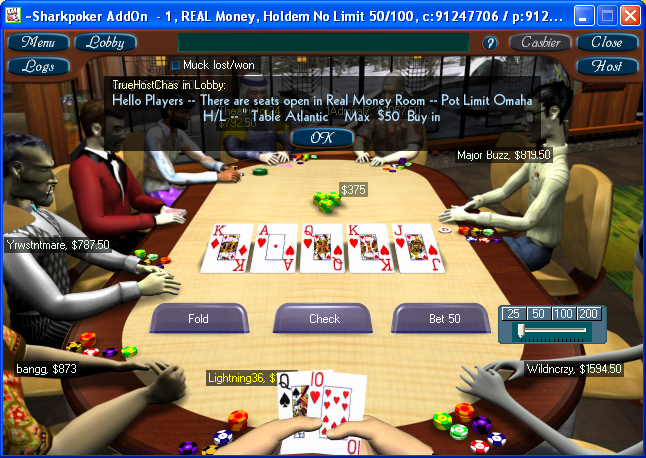 This was one of the first poker groups I joined when I began playing. All the tips I learned at Cardschat.com helped me so that I wasn't a COMPLETE donk when I began playing Hold Em. If you are looking to get a good fundamental education on Hold Em, check this group out. I was getting terrible cards and was surviving by betting big everytime I actually caught something. Then, as I have seen in almost every tournament I have won, there is a crucial hand where the poker gods seem to actually be on my side. Short stacked and in a blind, I get Q-rag. The flop comes, and it is Q-rag-rag. I go all in, as do the other two at the table. They happen to each have a pocket pair - A-A and K-K! Well, those poker gods delivered me a Queen and kept the Aces and King from appearing on the turn or river. Suddenly, instead of being the short stack, I actually had some pushing power. Last hand: Heads up and I complete a straight on the river. I had stayed in the hand with a small pair before this. I checked on the river, and the other player, whose stack was much smaller than mine, sensed the weakness I displayed and went all in. I called - end of tourney. Of course, things don't always work out. Last night, I was playing in one of the PokerHost freerolls that awards the winner a seat in the upcoming $15,000 freeroll. Nothing for second, third, etc - only one prize. Five people left. Blind are getting pretty big. I have a nice stack, but you know how quickly things can turn around at this stage of a tournament. I am dealt A-10. The short stack goes all in and I call. Another player also calls. The flop is 10-rag-rag. With top pair and an Ace kicker, I decide to go all in. I thought that I have the all-in short stack beat and I am expecting the other player to fold. Surprisingly, he doesn't, but goes all in. Well, each of the other players has a King. A King comes on the turn, they end up splitting the pot, and I go out in 5th place. Did I play that hand wrong? I am surprised that the other player went all in with nothing but high cards. Dat's poker, I guess.